I came across the inspirational short Invisible Wings when it was first featured on Karma Tube in 2015 and have watched it several times since. It touches a soft spot in me. It opens my heart, and I feel the flow of my own life moving through me. It generates reflection and gratitude…all channeled through the words of a 65-year-old tea seller named Vijayan against visually beautiful backdrops. His use of the metaphor ‘journey’ in the film is important as well as the way he validates it. A bona fide journey isn’t over smooth ground but fraught with challenges along the way. If we meet those obstacles eye-to-eye, it encourages our growth, nurtures the spirit and frees our dreams…to manifest. If we don’t, it harnesses the soul. All this from a man many may overlook: the owner of a small stall in India where he pours tea, his wife Mohana working beside him. They appear to have little in the way most would see them. But Vijayan carries a dream— to travel the world, to open his heart and mind to other lands and ways of living—and his wife shares that dream. They have traveled the globe. Even though, at the start of their marriage, she’d never been out of her own hometown. It takes courage to face the Unknown, to step out of your comfort zone. But the comfort zone so quickly widens when you do…no matter that others think you’re crazy or try to hold you back. There is so much beauty to be experienced when you ignore those who remain in the corral. Whether you take the initiative to make life happen or sit back and let life happen to you, it’s a choice—even if you don’t think the latter is. And while the title of this tribute to Vijayan and Mohana is called Invisible Wings, the wings any of us wear are visible and how we wear them: fully extended, clutched to the side, or somewhere in-between. Others easily see them if they pay attention. And we ourselves can feel them. Nothing is more valuable than the felt presence of your own unleashed spirit, intimacy with family and friends…and a life fully lived…however you travel. I’m sharing this little film here—short in time but saying so much—with intent that it brings to you the sweetness and consideration it has for me. Agafia Lykov. Photo credit: Siberian Times. 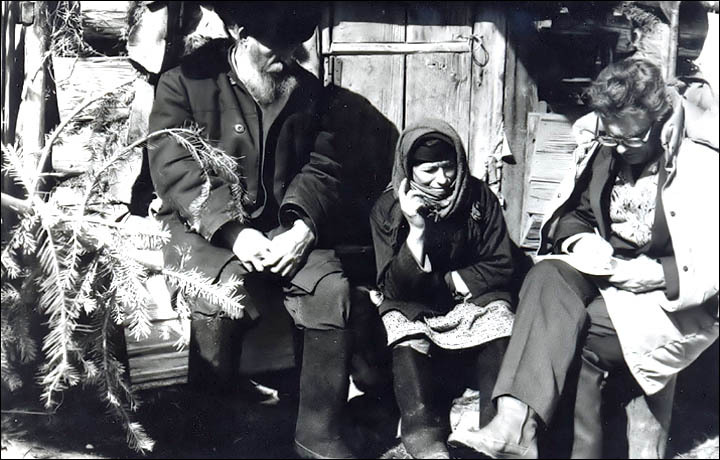 In 1936 Karp Lykov took his family and fled into the Siberian wilderness to avoid Stalin and persecution because of their religion. Called the Old Believers, they belonged to a sect of Russian Orthodox fundamentalists. Over the years they retreated deeper and deeper into the Taiga, a forested region in the heart of Siberia, where temperatures are extreme and civilization is non-existent. Agafia was born into that life in 1943. Agafia saw no one but family for 40 years. And then no one at all for 25 years until a geologist moved a short distance away. All that time, she’d been a woman alone, living off the land. Journalists from Vice Media visited Agafia to shoot a documentary about her life for their Far Out series. She relates what it’s like to live in the company of her animals, her faith, occasional encounters with bears and rocket debris, a way of life that gets much more difficult as she ages. Her story is an example of pockets in the world where people are living in solitude by circumstance and often by choice. Watch it online for free. Length: 36 minutes. To read about another in this series and watch the documentary, see Faustino’s Patagonian Retreat.